6” x 9” for Webcomics. Our online comic book printing company’s nationwide customer base from Los Angeles to NYC has given us a 9.4 Trustpilot Rating and a BBB rating of A+. Read our Rave Reviews and try us out for yourself. Thousands of satisfied customers can’t be wrong. Satisfaction Guarantee! We specialize in high quality short run, small and digital book printing in quantities of 10 to 1,000 and bulk offset printing comic books for quantities over 1,000. Delivered to your doorstep in 4 to 7 days with cheap prices and a satisfaction guarantee! What Are the Dimensions for Printing Your Own Comic Book? 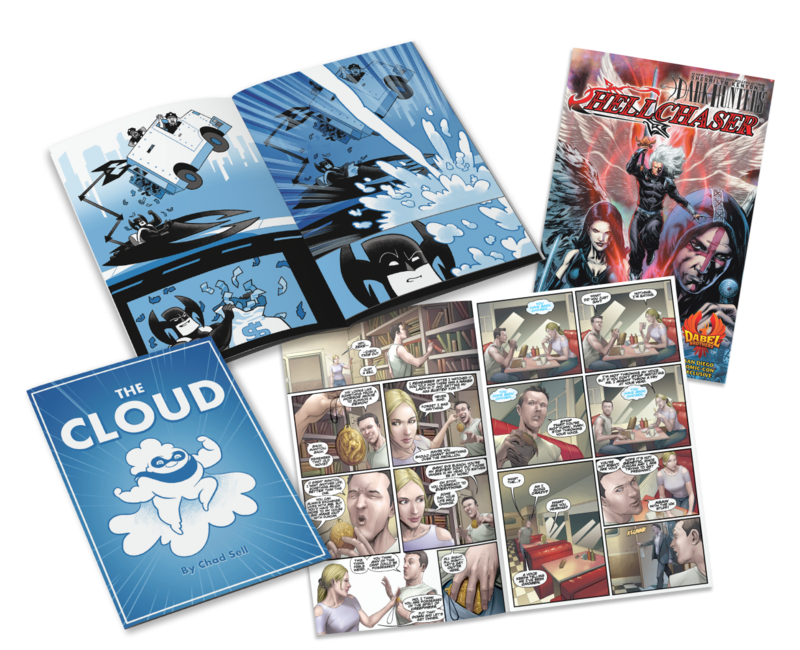 Our most popular printing comic book sizes are 6.625” x 10.25”, 6” x 9”, and 5” x 7.5”. We also offer other portrait sizes such as 8.5” x 11” and 5.5” x 8.5”, as well as landscape sizes 8.5” x 5.5” and 9” x 6”, and square book sizes 8” x 8” and 6” x 6”. Custom sizes are also available. You can order in quantities of 10 or more for your best value directly from your desktop. How Much Does it Cost to Print a Comic Book? How Many Pages Do You Need to Print a Comic Book? Saddle stitch binding requires any publication to have a minimum of 8 pages (and up to 92 pages) and be in multiples of 4 (8, 12, 16, 20, 24, etc.). How you number your pages depends on the final page count. For example, in an 8-page booklet, the front cover is considered page 1 and the back of that page will be page 2 (inside front cover). The inside pages will continue like the diagram below as 3, 4, 5, 6 and so on. The last 2 pages will be your inside back cover (page 7) and the back cover (page 8). Exactly as expected! Quality, print and paper. The comic book were delivered on time and the quality was excellent. I was very happy with whole process.